Over the years, he noticed that a lot of water was used during the washing process. In addition, Slattery had occasionally noticed a foul odor when he wandered into a nearby forested area where the septic drains were directed. Slattery reached out to the New York State Department of Environmental Conservation, which directed him to the New York Green Business program. The latter group manages the Pollution Prevention Institute at the Rochester Institute of Technology, which offers incentives for businesses and other entities to make advances in sustainable practices. The system’s primary component is a slow sand filtration tank, which was familiar to engineers at the University of Buffalo (another cooperator that joined the cause). 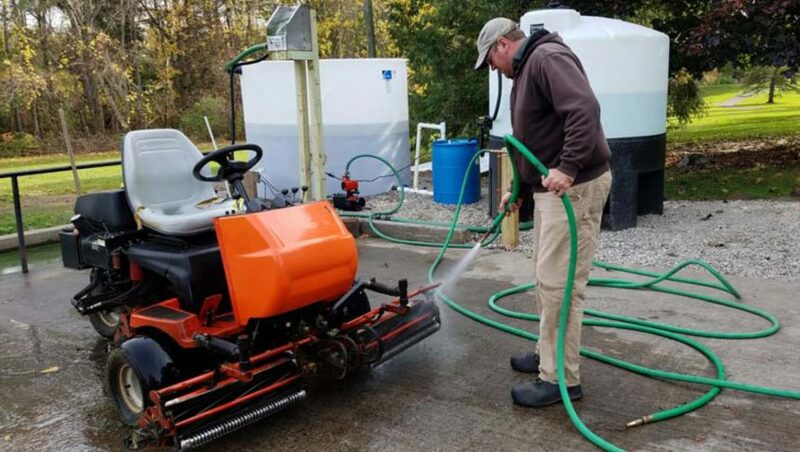 In short, filling an environmental “gap” at Locust Hill resulted in a cooperative effort that not only improved the golf course, but ultimately helped solve similar quandaries at golf courses and other facilities in New York and outside the state. And, in the process of solving a wash pad problem, the venture also offered a project to students that ultimately helped advance their education.